Sometimes it’s good to hear a more detailed account of a client’s experience. Thank you from the bottom of our hearts to our clients who have taken the time to share California home care stories with us. About 2-1/2 years ago my mom was diagnosed with a mild form of dementia. She was living alone at the time and we needed to begin the process of having someone come in to make sure everyday matters such as medications, errands, groceries and the like were being managed. 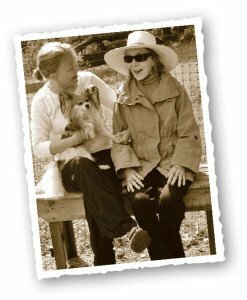 Initially, Mom needed more of a companion/caregiver. Hired Hands Homecare was recommended to us by our physician here in Sonoma Valley. We interviewed with a Hired Hands caseworker and were asked dozens of interesting questions to determine our needs and what kind of caregiver would be the best fit for my mom. I have nothing but the highest praise for how Hired Hands handled this delicate process. It was not long, really a short time, before they found the perfect match for my mom…more than one! These lovely caregivers even managed my mother through a very difficult move from one house to another located near mine. Mom was 87 at the time and it was a very emotional experience for her. She had lived in that house for over 18 years. They helped pack boxes, held her hand, smiled and eased her through the change. As often happens, my mom’s dementia slowly worsened. In addition, she had two hip replacements within four months—a very stressful and frightening time for both my mom and our family. Hired Hands was there with us every step of the way and was a part of our rehabilitation team. Upon her return home, Hired Hands jumped in and found the right people to work with Mom on a full-time basis. These lovely ones have become trusted, reliable members of our extended family. Because they have so much experience in the caregiving profession, Hired Hands would recognize changes in my mother’s situation long before our family was able to. In this regard, they assumed a leadership role, helping lead my family through complicated issues and stressful moments. At times my family was not clear whether Mom should continue living in a house or move to a nursing home. Again, Hired Hands helped us untangled the strands and make what was, for her, the absolute right decision. This is not an easy business on either side of the relationship. Hired Hands is a truly well-run, professional organization that understands the difficulties faced by families in need of caregiving. I think they could run a busy airport, maybe two or three! Of course, we were assigned a case manager to care for us. If after hours, or if she was unavailable to take my call, whomever I spoke with at Hired Hands understood exactly my situation and could respond efficiently. I never waited for a call back. This was the case on weekends, holidays. Hired Hands could respond as a team and solve my problem no matter when I called. Who does that? Compassionate, efficient, professional. Quite simply, Hired Hands has your back. We could not have managed the past 2-1/2 years without their assistance. I say this in terms of their help managing the stress involved by providing the absolute best at home caregivers, but there’s more: Hired Hands has helped secure my mother’s physical and mental well-being through dedicated dementia support and care. I recommend their services without reservation. It is a complex relationship and I don’t know how they actually manage to make a business into something that feels so personal and caring. Brava! ~ Carrie K. Click to download copy of Carrie’s story. At Hired Hands Homecare of Sonoma, Pleasanton, and the surrounding area we provided the dedicated Alzheimer’s care and dementia support that families in our area need and deserve. Contact us today to learn more about our we can help your family.